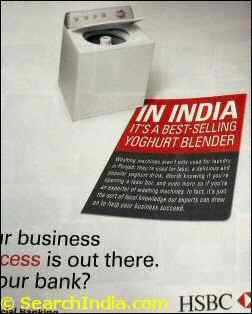 Can this Lassi Ad Really be True? The latest issue of New Yorker magazine (Oct 6, 2008) has an HSBC commercial banking ad on P.30 which claims that in Punjab washing machines are not used just for laundry. Apparently, washing machines are also used in the North Indian state of Punjab as a yoghurt blender to make that delicious drink all Indians love – Lassi. God almighty. Can this really be true? Wonder what they use the dryer for in Punjab? Any idea? One Response to "Can this Lassi Ad Really be True?" and there will be more to come…… to be continued!